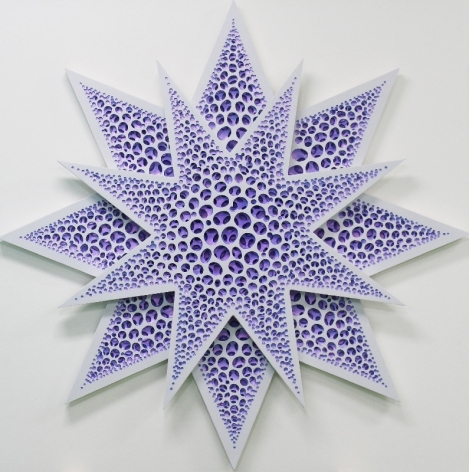 Sundaram Tagore is pleased to present new and recent work by Korean artist Kim Jaeil (born 1969), who produces perforated, sculptural paintings cast from resin. Raised and educated in Seoul, Kim Jaeil works in a manner similar to an earlier generation of artists who lived through the Korean War. Beginning in the 1970s, those artists began producing abstract works in a conscious shift away from the realist painting style favored at the time. This influential era of artistic development in South Korea marked the early stages of the Dansaekhwa (monochromatic painting) movement, which challenged the prevailing aesthetic of traditional Korean art. Produced using minimal palettes with a focus on negative space, this non-figurative style of painting emphasized process and materiality, as well as inner exploration over visual expression. 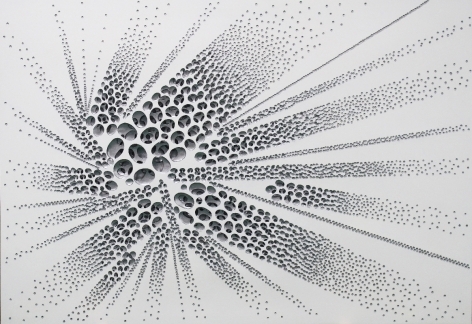 Although Kim’s work references pioneering Dansaekhwa figures such as Park Seo-Bo and Chung Sang-Hwa, he cites Western art, including relief work by American artist Lee Bontecou and the spatial theories of Italian painter Lucio Fontana, as his primary influences. 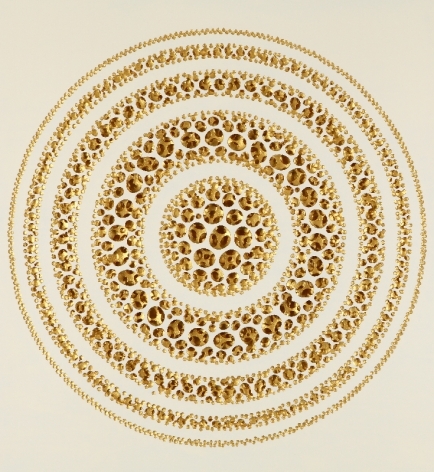 To create his punctured, cast-resin works, Kim uses his own unique process of intaglio, a centuries-old printing technique that incises a form into a surface. 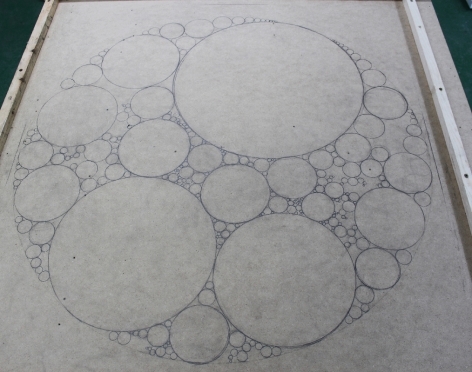 He begins by sketching a composition on a flat surface. 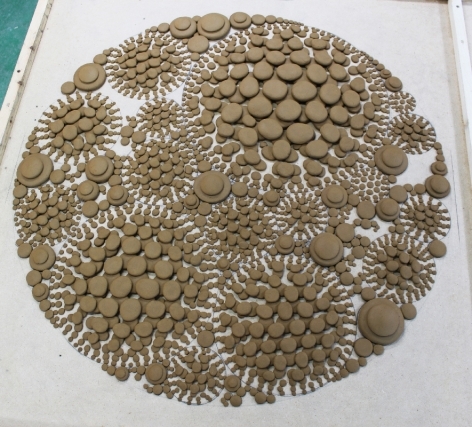 Once it’s finalized, Kim builds a form out of clay in three connected layers, into which he pours resin. 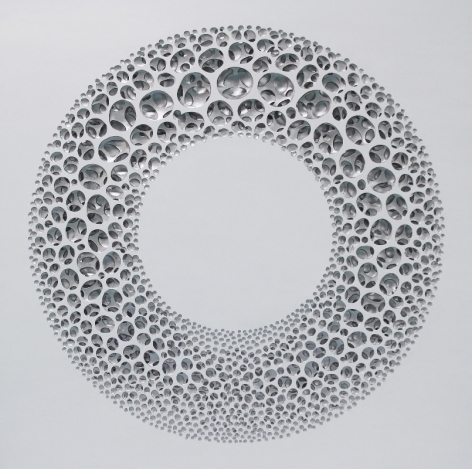 Once hardened, Kim carves the resin structure and applies acrylic paint, producing a mesh of circular pockets illuminated with vibrant, light-reflecting hues. Each painting can take up to a month to produce, depending on the size and complexity. Kim’s compositions vary. 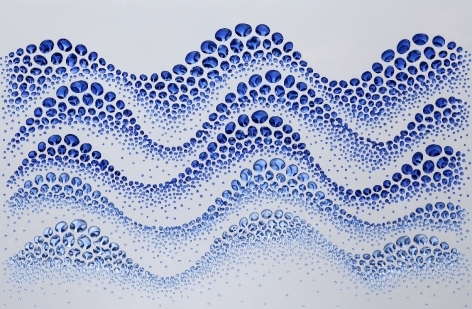 Some are inspired by forms found in nature, such as waves or stars; others are more abstract, such as Vestige (Space Blue), a configuration of circles shaped by hundreds of carved dimples highlighted in jewel-tone blue and purple pigment. 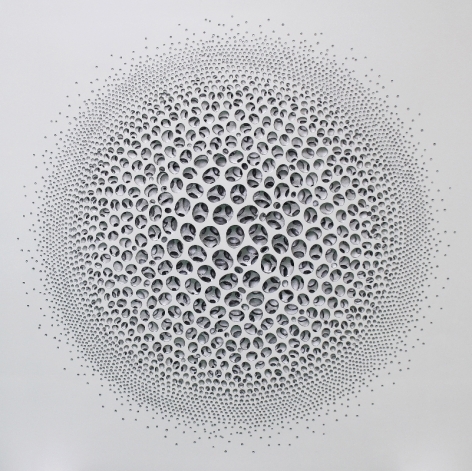 The result is an optical illusion created by the convergence of the cubic and planar layers, with the negative space accentuating the hollowed-out forms. Kim’s luminous hollows, strung together by an unseen connective tissue, compel the viewer to examine the work closely to discover its hidden depths. 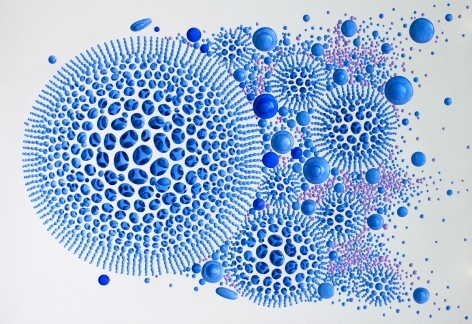 For the artist, these mystical spheres encapsulate both the microstructure of human cells and a galaxy of stars across the sky. 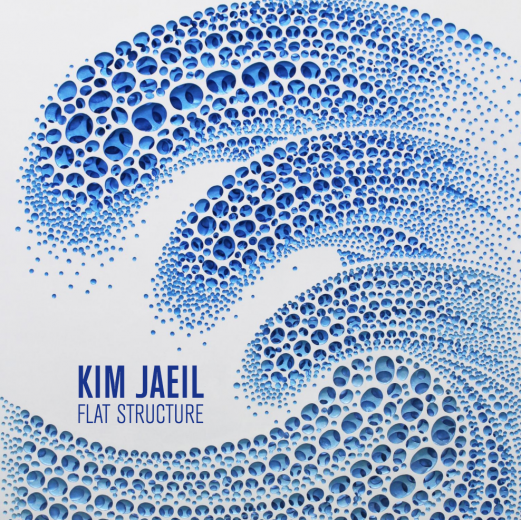 Born in Seoul in 1969, Kim Jaeil has a B.F.A and M.F.A from Hongik University, Seoul. 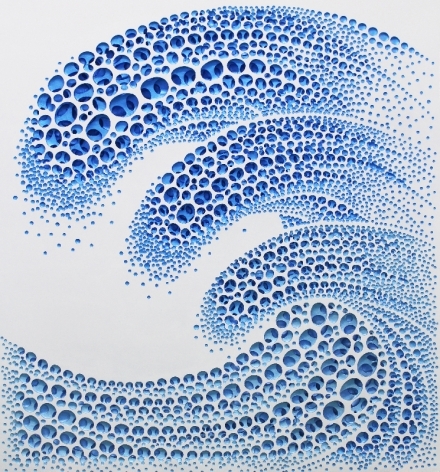 He has exhibited his work in numerous solo and group exhibits throughout Europe, Asia and the United States, including at the Seoul Museum of Art; the London Art Fair; Art Cologne; Fountain Art Fair, New York and Miami; and Art Osaka. He is the recipient of the Special Prize in the Misul Segye Art Contest, awarded by the Seoul Museum of Art. Kim lives and works in Seoul.